Join Cascadia Wildlands and conservation allies across the state at a rally to protect western Oregon's public lands, clean rivers and wild fish runs on Tuesday, Oct. 1 from 12:30-1:30 at Holladay Park (NE 11th and Holladay St.) in northeast Portland. Late last week, through legislation co-sponsored by Rep. Peter DeFazio, the House of Representatives passed a bill that will effectively privatize 1.6 million acres of public forestland in western Oregon and transfer this land into a "logging trust" to be clearcut in perpetuity. Sen. Ron Wyden is currently considering introducing his own bill that will likely increase logging on public lands in western Oregon. As we have learned from the past, runaway clearcutting will degrade drinking water supplies, erode salmon runs and harm other wildlife. The impending Senate bill could weaken environmental safeguards and limit public input in the quest to ramp up logging. We can't let this happen. We're turning up the heat on Sen. Wyden in the hopes that he will do the right thing and help protect what makes Oregon so special. We've asked you to take action on this issue recently. Now we are requesting your presence at the rally. We're rallying outside Senator Wyden's office at Holladay Park office to send a clear message: Oregonians want our public lands, waters and wildlife safeguarded into the future! 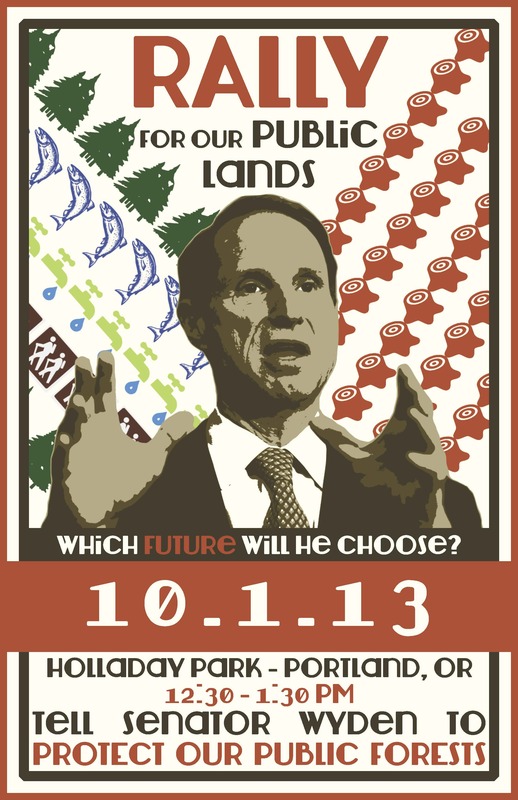 If you can't make the rally, please call Senator Wyden's office on October 1 (or anytime before or after) and tell him to protect our western Oregon forestlands for the clean water they provide, the recreational opportunities they offer, and for the salmon and wildlife they harbor. Washington, D.C. office: 202-224-5244; Portland office: 503-326-7525; Eugene office: 541-431-0229. You can also take action by personalizing a letter to the senator. To carpool to the rally from Eugene: Meet at 9:45 am (for a 10:00 am sharp departure) in the parking lot behind FedEx Office at 13th and Willamette St. Contact Cascadia Wildlands for more information: 541.434.1463. Bring a vehicle if you have one, your friends and neighbors, and hand made signs and banners. Hope to see you on Oct. 1!